1739 - Jan Baptist Vanhal, Czech composer, was born. 1755 - Italian violinist and composer Giovanni Battista Viotti was born. He wrote 29 violin concertos. 1845 - Gabriel Faure, French composer, was born. Click to see some of his works. 1884 - Bedrich Smetana, Bohemian composer, died. Click to see some of his works. 1960 - Elvis Presley recorded Are You Lonesome Tonight? 1977 - The Eagles song Hotel California went gold. Eug�ne Ysa�e, violinist extraordinaire, died May 12, 1931. Ysa�e was born in Liege, Belgium on July 16, 1858. He began to study violin at age 4, taking lessons from his father, Nicolas-Joseph Ysa�e, a violinist and opera conductor. Ysa�e later recalled that his father had been stern and demanding, but gave him credit for the development of his singing tone, for which he became world - famous. Ysa�e enrolled in the Liege Conservatory where he began studies under D�sir� Heynberg when he was just 7 years old. Ysa�e studied under violinist Henryk Wieniawski for a total of 12 lessons. These lessons proved to be a turning point for Ysa�e. From there he undertook studies under Vieuxtemps who, recognizing the young man's talent, obtained a government stipend to allow him to continue his studies. In 1879, with his career still in the budding stage, Ysa�e went to Cologne to perform. 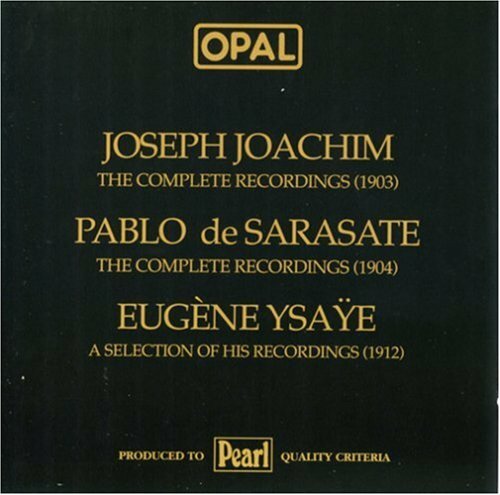 Here he was introduced to Joseph Joachim. It was also in Cologne that Ysa�e performed Beethoven's C minor sonata with Clara Schumann at the piano. In 1880 he became Concertmaster of Bilse's Orchestra in Berlin (later to become the Berlin Philharmonic). He held that post until 1881, when he left to tour Norway. In Paris, in 1883, Ysa�e met and became a close friend of the composer C�sar Franck. Ysa�e traveled throughout Europe as a soloist, taught at the conservatory, and organized the Ysa�e Quartet. He made his US debut in 1894 with the Beethoven Violin Concerto, and was very well recieved. By 1896 he was a professor at the Brussels Conservatoire, where he remained for eleven years. It was also in 1896 that he married Louise Bourdeau de Coutrai. Franck dedicated his violin sonata to Ysa�e and his new wife as a wedding present. From 1918 Ysa�e was the conductor of the Cincinnatti Symphony Orchestra. As a composer he is credited with 8 violin concertos, 6 violin sonatas and many other works. He died on this date in 1931. 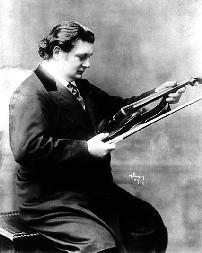 Eug�ne Ysa�e was a master of a violin technique in which the tone seems to vary about a base note. A finger is placed on the string and then the wrist is flexed back and forth allowing the ball of the finger to roll slightly causing the note to go slightly sharp (or higher) and then return back to the actual note. Can You Guess what this technique (which is actually used in most instruments and vocal music as well) is called? The technique is called vibrato.